Auckland Transport (AT) and the NZ Transport Agency are building a fully-integrated bus and train station at Pukekohe. Pukekohe Station will facilitate the new public transport network, which was introduced across Pukekohe and Waiuku on 30 October 2016. New station facilities will link bus stops with the existing rail platform. Commuter parking space and cycle parking will be provided along with improved connections to the local road and footpath networks. Stage 1 - construction of a temporary facility for new bus services and installation of traffic lights at the Custom Street/Manukau Road intersection. The traffic lights have been now been installed and are operating. Stage 2 - construction of the park and ride area, access way and pedestrian-bridge. Physical works on Stage 2 began 3 July 2017. The Park’n ride facilities, bus lane and shelters, public toilets and station platform are expected to be complete and ready for opening on 6 June 2018. The new overbridge will be opened late July 2018, once the old overbridge is removed. For customers requiring step free/mobility access, please continue to use the Station Road access until the new overbridge is opened. Facilitate increased public transport services. Better connectivity between new network buses and rail. Better and faster connections within the Franklin community and wider Auckland region. Enable bus and train timetables to be aligned. Increased park and ride facilities will encourage people to use train services. The project is being delivered in partnership with the NZ Transport Agency (NZTA) and will cost $15.4 million. 2015 – NZTA funding for design and detailed design. July 2016 – NZTA funding for construction. Stage 1 construction starts. October 2016 – Interim bus station facility opened for new network. July 2017 – Stage 2 construction starts. Mid 2018 – Construction complete. Construction across the entire project is progressing well and is on target for the opening of the new bus and train facilities from midday (12pm) on Wednesday 6 June. The overbridge is mostly complete and will be opened to the public in late July after the existing overbridge has been removed. Read more on the project updates page. Construction across the entire project continues to progress well, however the complex nature of the pedestrian overbridge has now pushed out works completion date to mid-2018. The Park & Ride area is rapidly progressing and will open to the public in late May. Read all details on the project updates page. The complex nature of the pedestrian overbridge has pushed out works completion date to mid-2018. The remaining elements of the upgrade, including the new Park & Ride area, station platform, bus lane and bus shelter, remain on target for completion in April 2018. Excellent work in early 2018 has seen Stage 2 of the Pukekohe Station upgrade progress solidly and is currently target for completion in Mid-2018. Continuation of works over the holiday period has seen the Pukekohe Station upgrade make dramatic progress across all the key construction sites and we are able to see an indication of how the station will look at the end of the project, expected to be completed in early 2018. Works begin in the Station Road car park on Monday 16 October. The works are expected to take around four weeks to complete and will involve the temporary loss of six car parks. The first two weeks of night works at Pukekohe Station have progressed smoothly, allowing work to continue on construction of the new concrete platform as well as the new pedestrian over bridge. Night works continue on the platform this week, installing drainage and building the foundations for later installation of the platform kerb units. Night works are scheduled to commence Tuesday, 26 September 2017 between the hours of 11.30pm and 4.30am. They will take place from Sunday to Thursday nights intermittently until mid-December 2017. The station upgrade continues to move forward, as the new pedestrian overbridge takes shape. Works to rebuild and raise the station platform are scheduled to begin later this month. Get more details on the project updates page. Construction is progressing well and on target for completion early 2018. 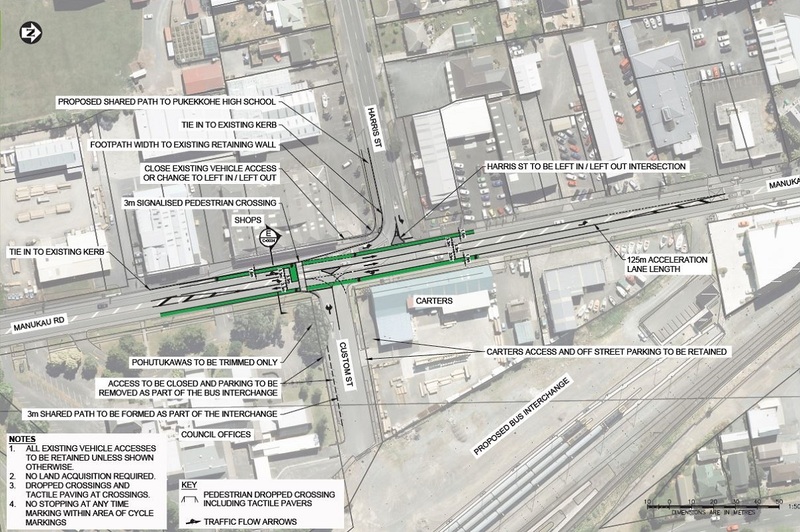 For the first 2 months, works have been located on the Manukau Road / Custom Street side of the track. Works are progressing on stage two of the Pukekohe Station upgrade. The initial works have mostly been preparatory and getting the necessary infrastructure in place. Preparatory works have commenced on the Customs Street park and ride site. We expect to start work on the train platform sites mid to late August. Works on stage 2 of the station upgrade begins on Monday, 10 July. As part of the upgrade, the KiwiRail land near the V8 bridge, unofficially used for car parking, will be closed indefinitely. If you use this parking facility, please make alternative plans. After a competitive tender process, AT has selected Downer to deliver the main construction works on the Pukekohe Station upgrade. Read the media release: Full steam ahead for Pukekohe Station. Piling works for the new pedestrian overbridge connecting Station Road to Custom Street have now been completed. The parking lot on Station Road has also reopened. We are closing the parking lot on Station Road from the evening of Sunday, 15 January to Monday, 30 January, to allow for the completion of piling works. Pedestrian access to the station will also be affected. We apologise for any disruption this may cause. From 13 December, there will be some changes to the station layout to allow for the construction of the new pedestrian overbridge that will connect Station Road to Custom Street. Buses will replace all trains between Pukekohe and Otahuhu Stations from 27 December 2016 until 3 January 2017 (inclusive). Main construction work on upgrading Pukekohe Station to a fully-integrated bus and train interchange started today. Read the media release: Upgraded Pukekohe Station to improve public transport connections. There is a temporary pedestrian overbridge at the southern end of the station for access to and from Custom St. Please be aware this overbridge has stairs. Access for those who can not use stairs is over Massey Avenue and along the walkway beside the rail line down to the station. Read media release: Pukekohe's upgraded station - a sneak preview. The New Network for South Auckland (including Pukekohe and Waiuku) has been launched. Find out more about the new buses and bus routes. From 12 September, there will be changes to the layout of the Harris Street/Manukau Road intersection. The restrictions allow for the construction of new kerbs and footpaths and will become permanent once works have been completed. Read the media release: Access changes around Pukekohe Station. As part of the work on the Manukau Road-Custom Street intersection, the public carpark entrance to the Auckland Council Pukekohe Service Centre on Custom St will be closed until September 2017. A dawn blessing ceremony has marked the start of the first phase of construction of the new bus and train station. Read the media release: Construction to start on new Pukekohe bus and train station. Auckland Transport (AT) is moving to a simpler and more integrated public transport network as part of the Integrated Transport Programme. A new network of buses and trains will change the way people travel, including the provision for improved facilities and need for some passengers to transfer at key stations like Pukekohe. 6-bay bus stops integrated with the existing Pukekohe Station. New overbridge with lifts to connect the bus and train station. Park and ride facility for 87 vehicles. Improvements to the Manukau Road and Custom Street intersection to aid bus and pedestrian movements across Manukau Road. 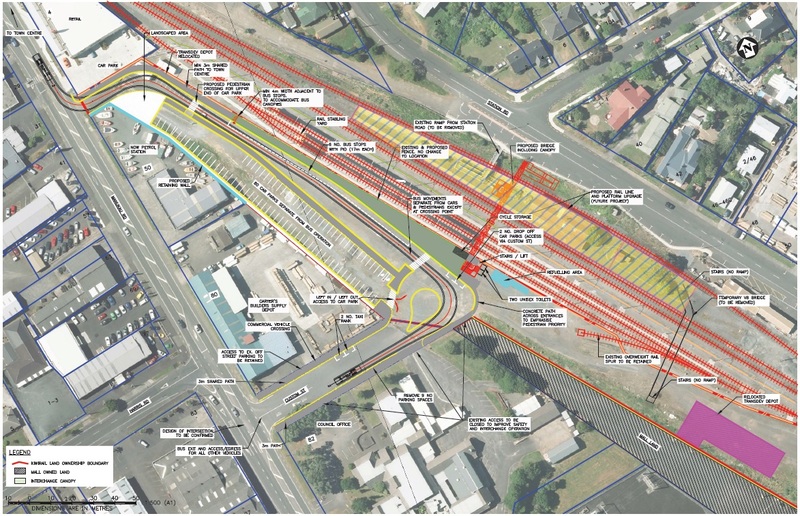 The proposed bus station and park and ride is located to the west side of the rail line with an overbridge to the Pukekohe Station and access to Station Road. International infrastructure firm AECOM have assessed the proposed bus station and parking facility and recommend that the project progress to detailed design. 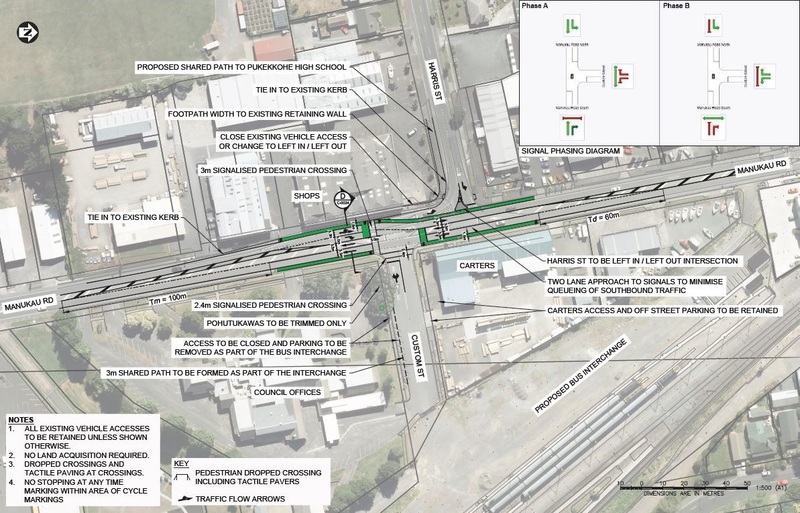 To improve bus connections at Pukekohe Station, AT reviewed improvements to the Manukau Road/Custom Street intersection. A long list of intersection options was reduced to 3, and AT selected signalisation of the intersection as the preferred option. A new set of traffic lights will be installed; these will be activated by traffic on Custom Street, allowing the new bus services to run to schedule. They will retain normal traffic flow on Manukau Road when there is no traffic leaving the station. The upgrade also includes a new controlled pedestrian crossing that will link the station with 2 nearby schools. To help keep traffic on Manukau Road flowing, the crossing will be fitted with a camera that will detect if someone is waiting to cross the road (if they leave, the request to cross will be cancelled). Faster and more efficient public transport services, especially for buses. Improves overall safety for pedestrians and users of the train station. Allows for the inclusion of a cycle lane. Manukau Road has limited pedestrian crossing facilities and has heavy traffic. The bus interchange will increase traffic from Custom Street, with 5 out of 6 buses turning across all lanes of Manukau Road. Buses will depart approximately every 20 minutes as a group. The intersection needs to improve to allow buses to exit on time and meet their timetables. With changes to the area (the bus interchange, park and ride, pathways to Manukau Road etc) additional patronage to the area and local schools on Harris Road will increase pedestrian traffic across Manukau Road. Similar in size to adjacent roundabouts. 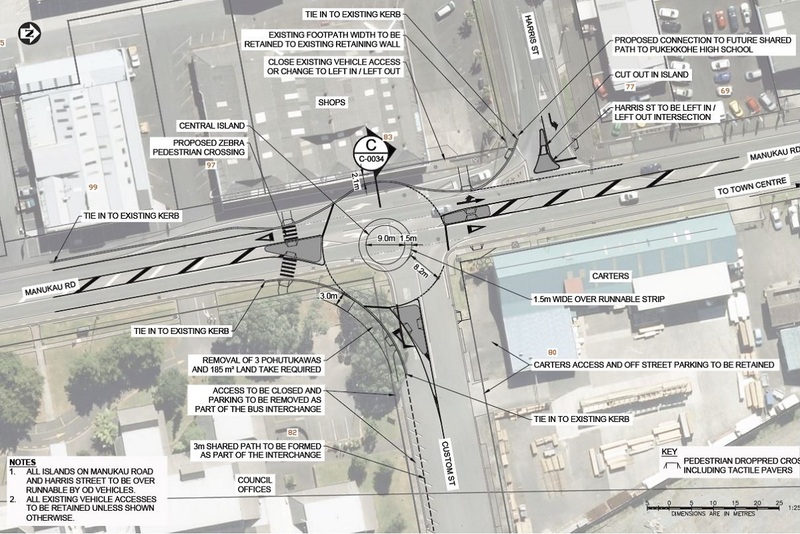 Zebra crossing included to assist pedestrians crossing Manukau Road. Requires Auckland Council land and removes Pohutukawa trees on Custom Street. Still difficult for buses to make right turn into Manukau Road during peak periods. Will require utility relocations and increase area for stormwater discharge. The addition of a cycle lane will increase land required. Signals located on Manukau Road and Custom Street only. Provides controlled pedestrian crossing over both Manukau Road and Custom Street. Manukau Road always has a green light unless Custom Street or pedestrian crossing triggered. No land purchase needed and Pohutukawa trees on Custom Street remain in place. Greatest reliability for buses to exit and keep to schedule. Buses exit Custom Street and accelerate in central lane to merge with Northbound traffic. Controlled pedestrian crossing installed to allow access across Manukau Road. No land purchase needed and Pohutukawa trees on Custom Street remain. Buses may have difficulty turning right during peak traffic as they don’t have priority. Cycle lane can be included.